Giant, wing-masted trimarans in the America’s Cup, hydrofoilers busting 50 knots in the Med, these innovations open a window onto a gee-whiz future that turns me on. But they don’t answer one question: Will we, or will we not in that future, still have with us the racing classics of yore? For every Dorade that inspires another and then another deep-pockets hero to step up and bleed money for the luster of being the trustee du jour, there are who knows how many boats that just get lost in the shuffle. They are the disappeared. That would be Michael Bogoger, on the Oregon coast, who has thrown his heart into beautiful restoration projects, but on a smaller scale. You can read about that at his blog, dory-man.blogspot.com. Michael doesn’t have indoor space for the Rhodes, so the work is weather-dependent, and then, every improvement is, ah, out in the Oregon weather. 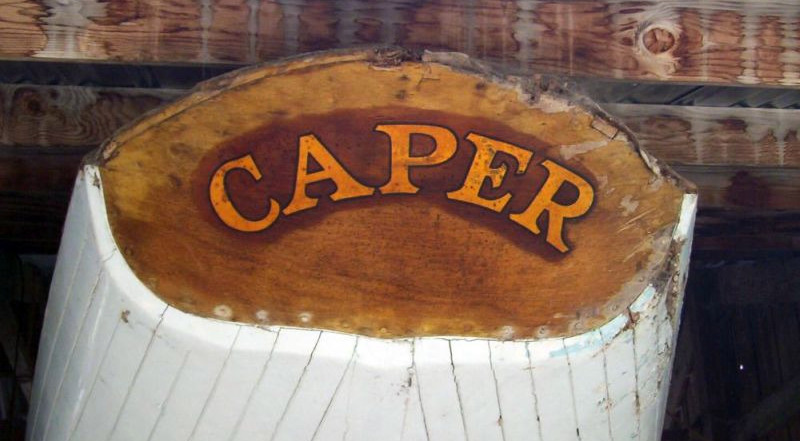 Caper was the boat/problem/opportunity that sparked the West Coast Wood conversation in the first place, months ago. Today, this old warhorse is still in need of a new home. Bogoger says now, “I am keeping her alive with infusions of TLC during the months that allow work outside. If I were a younger man, this fine old vessel would get a complete work-over. She is planked with African mahogany over oak frames. She deserves the best. 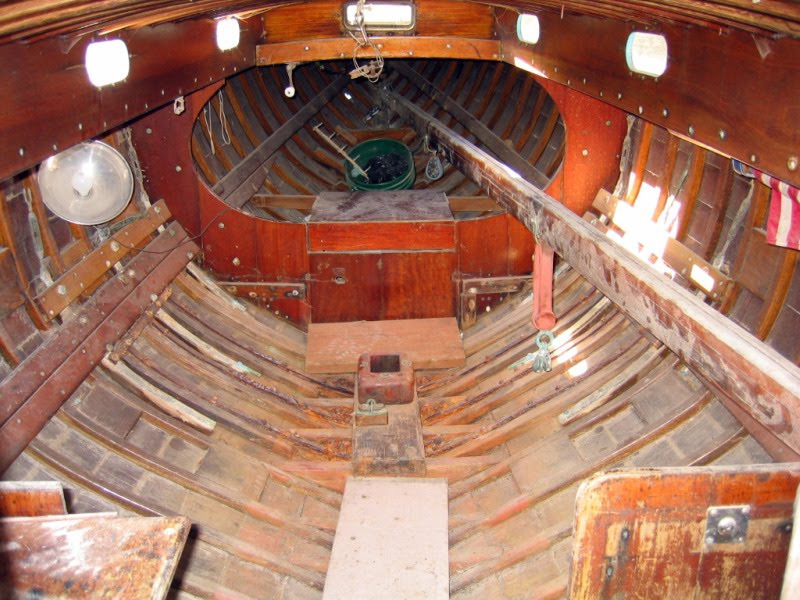 Last fall, fully enamored of the project, Michael displayed images of the boat and enthused, “Isn’t she a thoroughbred? Just look at that custom-made hardware and rigging. That stick on the deck is a roller-furling boom. 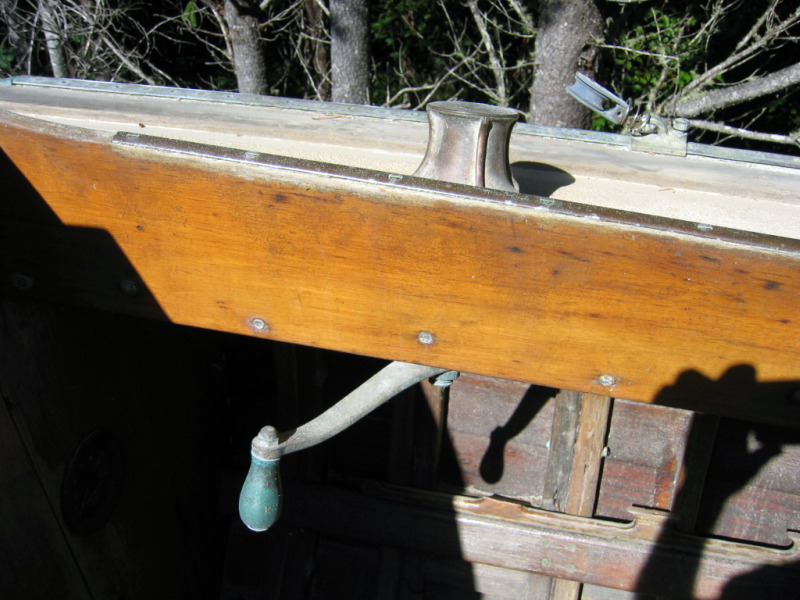 The boat also has a standard boom and all the fittings of an old racing yacht, including a bronze bell and two fine old compasses. “Racing was once a stylish and genteel event, no wonder the crew all wore ties! It’s premature, but the boat has a new set of sails waiting. Philip Rhodes designed the Rhodes 33 in 1938. The boats were built by the South Coast Boat Building Company in Newport Beach for short-distance and medium-distance class racing in Southern California waters, including overnighters (when the Southern California seabreeze shuts down and you spend the night with the mainsail rattling dew down the back of your collar every time the boat rolls, and whoever works hardest is half a mile ahead at first light). At least, in the Rhodes 33, you had a nice, deep cockpit for sitting in the “rain” and waiting for the beauty of the dawn, the slow gray coming of it, and the slant of the seabirds and the far-off cries, and off Southern California after a slow night, as the morning begins to warm, there are these small, ambulating lumps of a nearly-flat sea, with just a hint of wind-ripples teasing over here, teasing over there. But that’s not your racing breeze and there’s no use chasing. Between Los Angeles and Catalina, just a few miles clear of the roar of the 405 Freeway, I have seen dolphins breaking the surface from horizon to horizon. It was amazing. And lifelines weren’t exactly standard while Rhodes 33s were sailing overnight races in Southern California, so yes, sitting in the cockpit while racing at night would have been acceptable. Time lurches on, but hey, somebody out there actually raced Rhodes 33’s back in the day, which I did not. Who’s got a story? And who has a home for an honest chunk of West Coast wood. Who has a home for Caper? Or, perhaps, for the fully-restored Vixen, which would matter to Caper. Read on . . . This is Lanaki sailing . . . Which fits your palate? A project, or a showpiece? Rhodes #34 was purchased new by Ray Milland, the movie actor, sometime just after WWII. 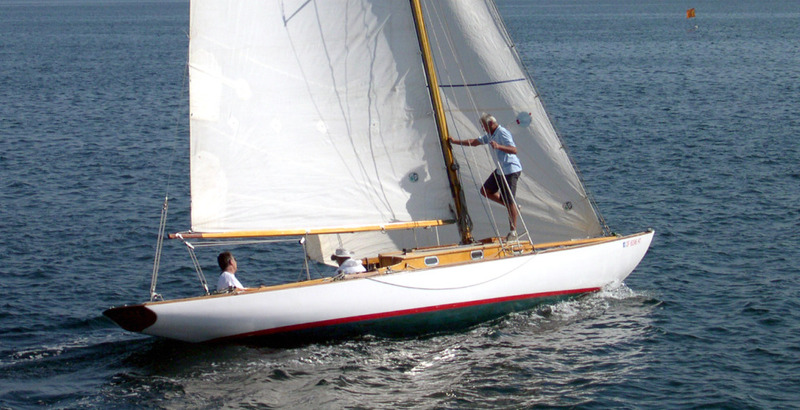 It was in the Newport Harbor YC roster in 1950 or 1951. 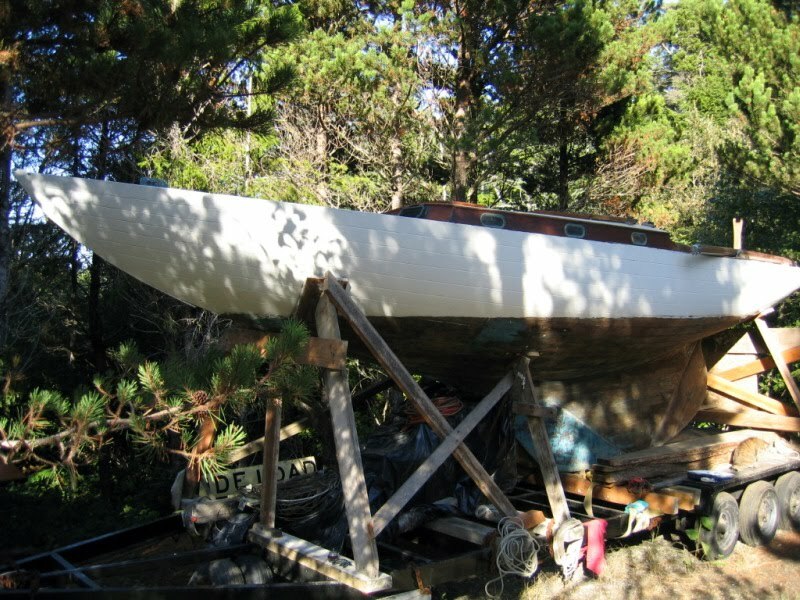 There must have been some other owner between Milland and Strat Enright, who named the boat Witch. He sold it to Paul Loveridge, who sold it to Gale Post in about 1963. Gale renamed her Therapy and painted her bright yellow. Gale performed extensive restoration after Paul’s “experimental” modifications. For instance, the mast was off-center since he wanted it to be more vertical on port tack. This was the favored tack going up the beach off Newport after a racing start.